Illuminated Manuscript of One Hundred Sayings, Opening decorated page with headpiece, Walters Art Museum, Ms. W.615, fol.1b, originally uploaded by Walters Art Museum Illuminated Manuscripts. 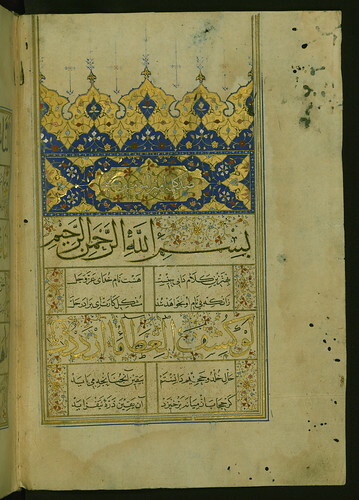 This beautifully illuminated manuscript contains One hundred sayings, known in Arabic as Mi’at kalimah and in Persian as Ṣad kalimah, attribted to of ʿAlī ibn Abī Ṭālib, the fourth caliph of Islam, as well as a Persian paraphrase (dubayt) by Rashīd al-Dīn Muḥammad al-Balkhī, known as al-Waṭwāṭ (Vaṭvāṭ) (d. ca. 578 AH / 1182 CE). This polychrome text, using a number of scripts, was executed by an anonymous artist most probably in the 9th AH / 15th century. Great readily available in Google Play shop, below I https://mobdroapp.meta.watch set up the emulator as well as you could after that Fine. Link for Terrarium tv update on Pc has coming up with lot latest movies,Hd tv latest tv shows for 2018 year.